Jeremy C. Young is an Assistant Professor of History at Dixie State University and the author of "The Age of Charisma: Leaders, Followers, and Emotions in American Society, 1870-1940" (New York: Cambridge University Press, 2017). He is a historian of the 19th and 20th century United States, with particular interests in the history of emotions, social movements, and political communication. This post was first published by Hippo Reads. Clinton’s dismissal of all political emotion as demagoguery misunderstood the moment and may have sealed her electoral fate. More important, Clinton broke with a rich tradition of emotional advocacy on the left that stretches back to the 1800s. For decades in the late nineteenth and early twentieth centuries, liberal reformers engaged in a unique type of charismatic speechmaking called “personal magnetism” that consciously sought to move and inspire audiences. Orators trained in this style learned to expand the pitch range of their voices, to speak poetically, and to produce an operatic tone by lowering their voice boxes – all in service of emotional persuasion. Clinton lost the 2016 election because she ceded this sort of political theater to Trump. As the reality television star gets ready to take office, Democrats face a stark reality: they will continue to lose until they rediscover the historical politics of emotion liberals once championed. 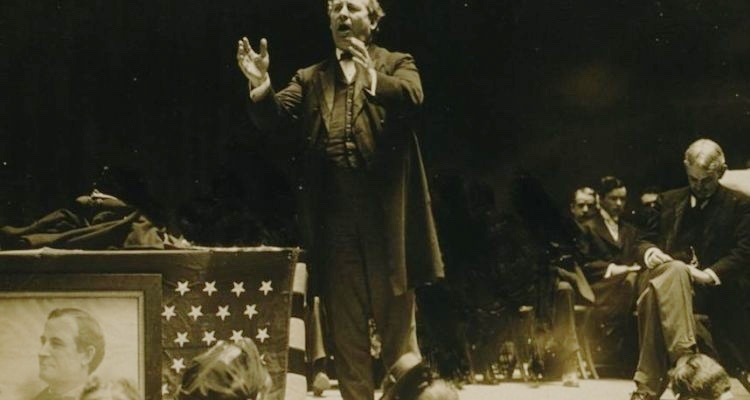 The inspirational oratory of the left is perhaps most famously embodied by William Jennings Bryan’s “Cross of Gold” speech at the 1896 Democratic National Convention. “You shall not press down upon the brow of labor this crown of thorns,” the former Nebraska congressman shouted, gesturing wildly to illustrate the urgency of currency reform. “You shall not crucify mankind upon a cross of gold.” The delegates’ response was unlike anything reporters had ever seen. “In the spoken word of the orator,” wrote one, “thousands of men had heard the unexpressed sentiments and hopes of their own inmost souls.” The audience cheered for half an hour; afterwards, the little-known Bryan was nominated for president by acclaim. In the 1920s, popular radio broadcasts introduced a more conversational speaking style, and personal magnetism quickly fell out of favor; a speaker using its techniques would fare poorly with modern audiences. Nevertheless, many voters still long for an emotional connection with politicians. Today, when the left’s success increasingly hinges on its ability to energize voters and deliver them to the polls, opponents of emotional politics risk depressing voter turnout or driving voters into the arms of the right. It’s easy for Democrats to criticize Trump as a demagogue or his voters as unreasoning dupes. In truth, however, American democracy has never operated primarily on the basis of reasoned debate. Emotion is the common currency of American politics, the vital democratic connection between leaders and followers. Clinton’s greatest failure in 2016 was in treating political emotion as a threat to democracy, rather than as the essence of it. “To drive real progress,” Clinton conceded this past July, “you have to change both hearts and laws.” But Clinton failed to do the first of those things; now, as a guest at the inauguration instead of its star, she won’t have a chance to do the second.